May is a month when pleasant winds blow and the sunlight becomes more brilliant. 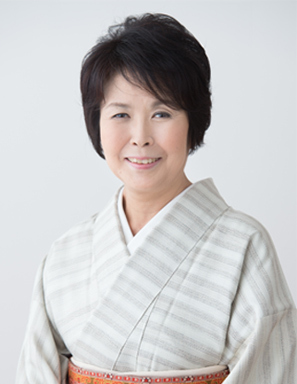 As we enter the rikka period of the lunar calendar, the calendar's summer begins. The Chinese characters that make up the word rikka mean "summer stands," and this season is the one where we first start feeling traces of the coming summer. Taking place between shunbun, the vernal equinox, and geshi, the summer solstice, rikka is named in astronomy as the time where the sun has reached a celestial longitude of 45 degrees, and as such, its date changes every year, falling around the 5th of May. This is the time just beyond a season known for the return of cold weather amid the cherry blossoms, when spring greenery begins to flourish. To gradually acclimatize the body to the change in temperature, why not prepare our bodies for the season from within by eating seasonal foods? Our main dish this time is chickenwhich has a pleasant acidity in it. Here's a simple recipe so that you can enjoy it at home. When you're not used to the heat yet and find yourself starting to wilt, a bit of acidity is nice to encourage the appetite and aid with digestion. 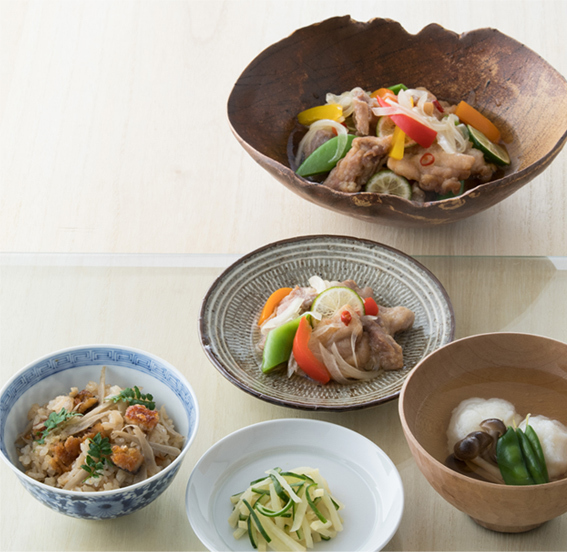 With plenty of colorful summer vegetables, this chicken nanban features the sweet and sour flavors of nanbanzu vinegar, and thinly-sliced sudachi (a citrus fruit similar to limes), which make this crisp, fried chicken a refreshing dish. ❶Cut the chicken thigh lengthwise into two pieces, then cut each piece into bite-sized strips. ❷Cut the onion to thin half-moon slices. ❸Cut the bell pepper lengthwise into 1cm-wide strips and boil briefly. ❹Pull out the tough string of the snap peas. Blanch the snap peas in salted water, then cut diagonally into halves. ❺Mix the ingredients for the nanbanzu in a pot, then add the vegetables from steps ❷-❹. ❻Lightly salt the chicken pieces from ❶, then apply a thin coating of tempura flour and fry in oil heated to 180C°until crisp. ❼Add the chicken to the nanbanzu prepared in ❺ and allow it to absorb the flavors. In the "doyo no ushi no hi (midsummer day of the ox)" which falls between late July and early August, many people like to eat eel. 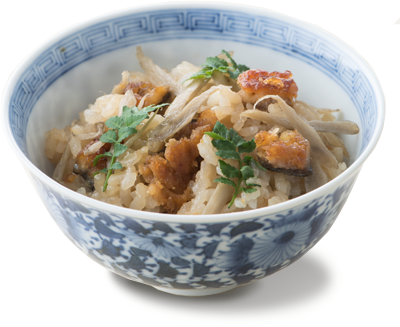 In this instalment of "Teishoku of the Seasons," we made an original version of mamushi gohan by pairing eel (often called mamushi in the Kansai region) and fresh summer burdock. As for where the mamushi nickname came from, there are a few explanations; the strongest explanation is that it comes from an altered pronunciation of mabushi gohan, meaning "coated rice," as one coats the rice with the prepared eel. Enjoy the flavors of this dish with the rich, gentle aroma of fresh burdock. Kakuya is made from pickled vegetables such as cucumber, and with the saltiness of takuan and furu-zuke, it's well suited for when you don't have much of an appetite. 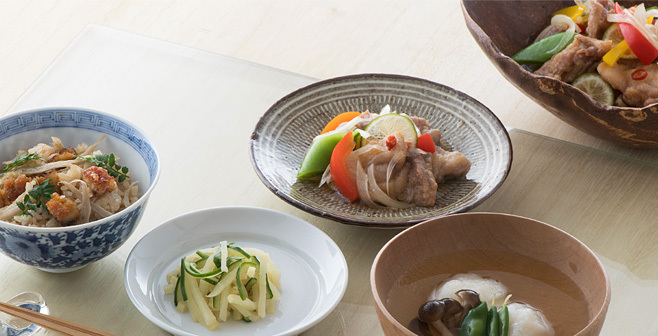 The vegetable lactobacillus of furu-zuke is recommended for people who get indigestion from eating cold foods. 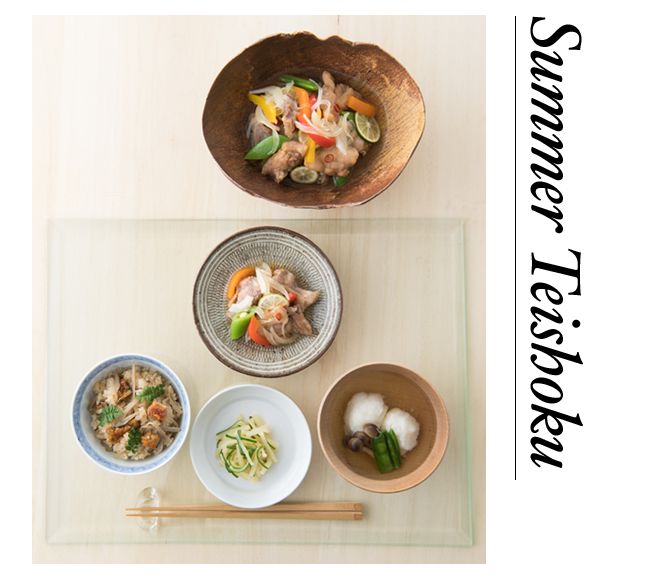 Starting from this instalment, we'll be looking at the plates, dishes, and bowls used to serve Japanese food, which are part of the experience in their own right. We asked Ms. Goto to share a few words on the relationship between food and the items used to serve it. The secret to enjoying Japanese food is not to just savor the flavors and arrangement of the ingredients, but to also "savor" the plates, dishes and bowls with which they are served. Japanese dishware comes in many shapes and types, such as pottery and lacquerware, and to enjoy the beauty of pairings, it’s important to start by learning the basics. For example, you might go to a museum of art and look at the "originals" created by our ancestors. Once you have learnt about the basics, trying arrangements with the serving dishes that you can acquire yourself is the best way to learn how to use the right items to bring out the qualities of your cooking. 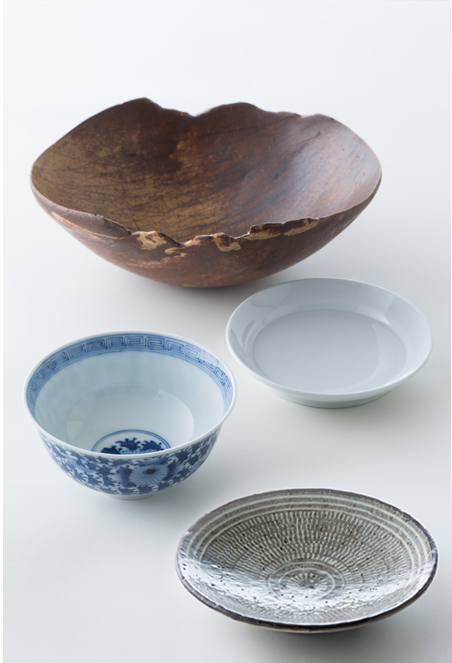 Like with kimono and Western clothing, plates, dishes, and bowls are all about coordination. Don't just think about which ones to use by starting with certain foods in mind - it's also fun to decide on what to use first, and then think about what kind of food would suit. The best way to develop a sense for this is to try, fail, and study, rather than overthinking it too much. I hope that by directing your attention to the plates, dishes, and bowls you use, your day-to-day dinner table will offer an even more fulfilling experience. We served the chicken nanban in this bowl created by Mr.Kazuo Yagi. Normally a crafter of objets d'art, he made this tableware on a whim, and its loose shape gives off a sense of playfulness. This earthenware piece has a sense of presence that makes it well suited for playing the lead role. 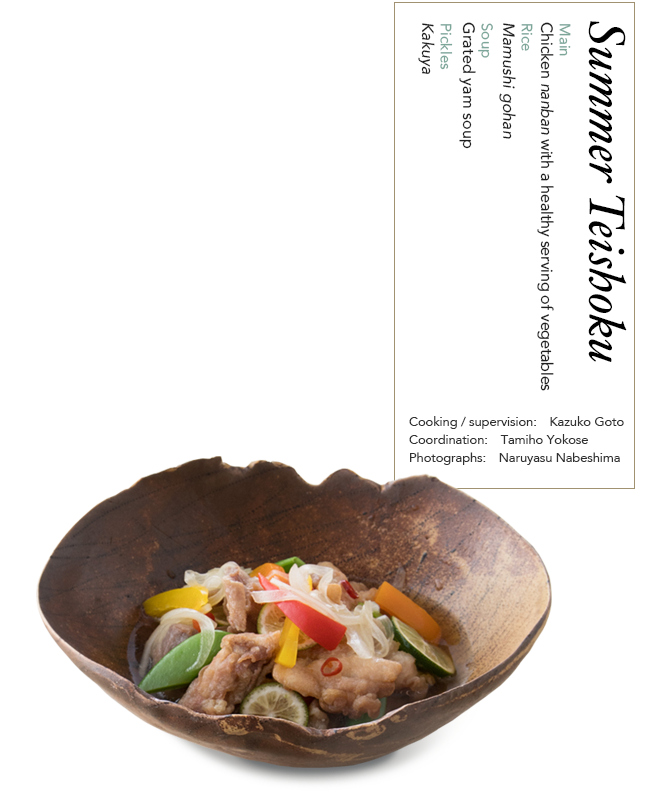 The refreshing, pale blue of a sometsuke-style bowl is well-suited for bringing some balance to a hot day. Kakuya beautifully contrasts the white color of takuan with the green color of cucumber, and this contrast becomes all the more refreshing against the pellucid white of this Korean porcelain. The white color of these dishes gives food a sense of depth. 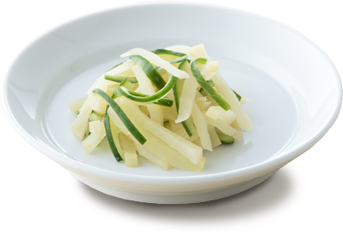 Though plain at first-glance, hori-mishima plates make an ideal counterpart for colorful vegetables. The soft colors and modest design serve to bring out the qualities of the food.